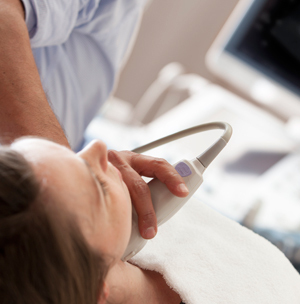 Small parts ultrasound provides images of breasts and certain superficial masses. X-rays are not used during this exam, but rather ultrasound is emitted by a probe in the form of short pulses. An ultrasound of the breasts can be prescribed as an adjunct to a mammogram exam. You will then be taken to the exam room where the radiologist will apply a gel to the area to be examined and will take pictures using an ultrasound probe. - If you are coming for a breast ultrasound, it is VERY IMPORTANT to bring your previous mammograms and ultrasounds (on film or CD) and the reports pertaining to these.